ALZETA® Corporation is a leader in innovative surface combustion technology. Our advanced engineering team applies extensive research and development to meet the needs of industrial and commercial markets worldwide. From emissions control to customized heating solutions, our surface combustion burner solutions are cutting edge. Ongoing research and continual progress in surface combustion technology introduces new solutions to meet evolving emission standards set forth by environmental agencies. ALZETA began as a research company, and we have maintained that approach to technology and product development ever since. Continuous innovation in design and manufacturing provide low NOx emissions and cost effective products using advanced surface combustion techniques. ALZETA combustion technology meets the increasingly stringent air quality control requirements set forth by the various regulatory bodies around the world. With both low NOx and ultra low NOx solutions, we develop new surface combustion systems to meet new and challenging applications. Partnerships with agencies such as the U.S. Department of Energy, California Energy Commission, and Southern California Gas Company have helped bring about some of the latest and most advanced combustion technology available in the market today. To learn more regarding innovative solutions for energy technology, contact the experts at ALZETA Corporation. 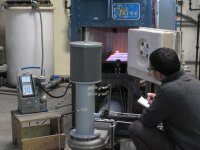 We take on challenging applications to design customized surface combustion solutions adhering to your environmental and thermal requirements. Let our engineers design the perfect solutions for your application!